My Students Blew My Unit Up, and It’s a Good Thing! Is THIS on Your To Do List? As soon as I spoke the word “story” in the minilesson to fourth graders in a public school in NYC, I knew it was the wrong word to use. When the staff developer from the Teacher’s College Reading and Writing Project gave me feedback, I learned a lasting lesson. The lesson wasn’t just to use “story” only when talking about fiction and “text” when using non-fiction, but more importantly, it was to be precise and purposeful with our language in workshop. I keep that idea in mind when coaching teachers in workshop. Today I am sharing some of the small shifts in language that I have found to yield big rewards with our students. Jeff Anderson, author of Everyday Editing, shared this phrase that I have incorporated into my practice. Sometimes we make assumptions that a student made an error, when in reality they were attempting to use something they learned from a mentor text. This phrase opens up a conversation without imposing judgment on the student. You may learn that your student was trying something rather sophisticated, and now that concept is in the zone of proximal development. You just discovered a great teaching point for your conference. I find myself using this phrase not only with students, but also with teachers when debriefing a lesson. I have been working on this one as a personal goal since I first learned it at TCRWP. It is just a natural inclination to give the compliment and follow it with “but now I want to teach you”. What happens in the writer’s mind when you use “but”? Yes, it negates the compliment and all the student hears is the teaching point as a criticism instead of an opportunity for growth. Just a small shift to using “and” allows the compliment to be heard and processed and motivates the student to want to hear the teaching point. I have almost eliminated “but” from my language in conferences thanks to the feedback I have received on this goal from other coaches and teachers. For years I had been taught to use “Good Readers…” or “Good writers…”, although now I have learned to drop the “good” qualifier. Peter Johnson has done groundbreaking research about using precise language and the difference it makes for learners. His work prompted TCRWP to drop the good qualifier as some students will turn off from the rest of the statement because they don’t see themselves as good readers and writers. This is true for our spoken and written language on charts. Although we want all our students to realize they are good readers and writers, some do not see themselves that way. Often transitions are an area that can go awry in workshop. Mary Ehrenworth of TCRWP used this phrase that has become a standard procedure for me when conducting a workshop lesson. Before students transition remind them of your expectations and let them know you will be providing feedback in the form of a 1-10 rating. It may go like this, “Readers, let me admire you while you transition into your book clubs quickly and quietly with all your materials. Remember I will be rating your transition on a scale of 1-10.” During the transition watch for things to compliment them on and areas they can improve on. The students really respond to the number rating and work hard to improve that rating each time. It is imperative to give the compliments, “You all earned a rating of 8. I admire how you all have your materials ready and how you moved quietly,” and the areas to improve, “in order to earn a higher rating next time, you should watch out for each other as a community. Help your book club members if they need to move chairs and be sure to use your kind manners when passing in the same area. I am confident you can earn an even higher rating next time.” I assure you this is an amazing phrase. As adults we worked all week to earn that higher rating. I know you all have other examples of how precise language choices can yield big results. Please feel free to comment below to share with others. Make it a reading and writing-tastic week! I want you to think about a favorite teacher. My favorite teacher was Ms. Hall, 5th grade. I don’t remember much about her EXCEPT, she took the time to learn about who I was as a person. You see, I talked A LOT! So much that, according to school rules, I had to be assigned detention – frequently! But, Ms. Hall had worked with me enough that she knew I was a good student and a responsible citizen, so she gave me the privilege of helping her after school instead of silently sitting in a non-air-conditioned school room. You see, she spent time with each and every one of us and knew our strengths and did not judge us for our weaknesses. I had been told year after year that I was a disobedient student – less than capable. Mrs. Hall recognized my love for school, my enthusiasm and built on my strengths. She taught me to take my verbal skills and learn to channel them on paper, so that my talking too much became my love for writing. She took my high energy behavior and coached me in areas where it could be best used, helping her in the classroom. That is what workshop does in my opinion – the teacher finds the students’ strengths in reading or writing and builds on them. When you are creating the workshop community inside of your classrooms, you are doing just that…creating communities, building relationships. You are meeting with each student and getting to know who they are as learners and individuals. Let’s think about just one part of the workshop model. Let’s consider the conferring portion. You meet with one or several students and listen to what they are doing. The verb there is listen. Typically I ask “What are you working on as reader today?” A book discussion begins and somewhere in that conversation I get a small glimpse of what they do as a reader. I take that information and I build on it. Why? It help me find areas of interest and confidence. For example, let’s say the reader is discussing a book and seems to be focused on characters traits. My next step could be to bring their attention to some additional character work that they could be doing – like some individual characters actually have relationships that affect the problem of the story. Characters cause the story to go one way or the other. I would encourage the reader to pay attention to what the characters are doing and how they contribute to the story’s problem or resolution. When I leave that student, I have left him/her feeling good about the work they are doing, and I have taught them something new, If I were to focus on what they were NOT doing I would only discourage them as readers. I will leave you with an article that discusses something referred to as the 2×10. It is not exactly an academic article on how to help your students become better readers. It challenges you to take 2 minutes for 10 days to have meaningful, casual conversations with your most at-risk students. Only 2 minutes. The predicted and documented outcome is that the student’s behavior and productivity changed for the better. I know from my own experience that if you stretch that 2 minutes and 10 days to the entire year, the outcome is very powerful. If you include providing that student with confidence of what they are doing correctly and teach them new skills and strategies, you will end the year feeling like a master teacher. I hope you think about this topic this week. If you are just starting to use the workshop model, I encourage you to challenge yourself in this area of building trust and individual attention with your learners. If you are an experienced workshop teacher, reflect on the relationships from your previous year and make adjustments. Make it a reading and writing –tastic week! This week we have looked at goals, and a couple goal areas to get set for this up coming school year. Think about the areas of workshop. Which one is calling out to you? Which one will impact you and your students the most? The hope is to become more fluent in one area, while doing the best we can in other areas. Think, pray, and/or meditate over it and pick one. Just one. Once you have one aspect of workshop picked, ponder what do you need and want to learn in this area. You might be able to pick this easily, or maybe you are just starting in this work and don’t know where to start. Whatever the case, you may want to research a bit. Ask colleagues around you, read, look at data for students coming into you, or ask instructional leaders on your campus. Feel free to ask us as well. We’d be more than happy to help you sort through your thoughts. Perhaps you like video models to see things in action. If that’s the case, Vimeo has a great collection from TCRWP. You can find their library here. Perhaps you are more of an online learner. Twitter has amazing professional chats. #KatyIC and #TCRWP are two tags that I follow regularly. As we move through this process of setting a goal, we also need to consider ways to stay on track, a way to hold ourselves accountable. One way to do this is to write a SMART goal. 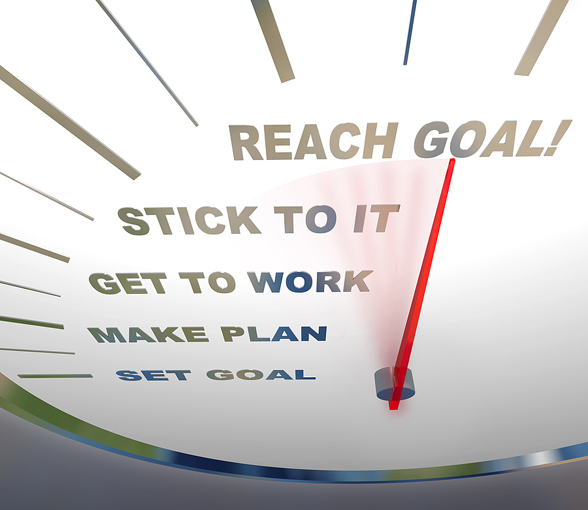 When making a SMART goal, we make our goals Specific, Measurable, Attainable, Realistic, and Timely. Whatever the way you spell out your goal, it is important to write it down. The act of writing helps cement it in your head and makes the goal real and concrete. On the accountability side, I like to share my goals. I share them in colleagues and my principal to help keep me on track. You may want to share with teammates, literacy leaders, and/or your administrative team. The people I share with help keep me on track, celebrate my successes, and encourage me when I have a set back. Find people that can give you the same support. Your cheerleaders if you will. We support and encourage the learners we impact. We need the same support as we are learning as well. Another area of your support you can use is professional blogs like this one. There are many high quality blogs out there. We are hoping this blog will be of great use to you and your growth. We are planning on looking at relationships, visible learning, logs, engagement, assessment, volume, and conferring so far. Writers rotate weekly to give you different perspectives. After all, one person can have some but not all the answers. Now if you have a question you would like answered, we would also be more than happy to help you out with what we can. Feel free to inbox us here or at livingtheworkshop@gmail.com. With our goals in mind and our readers and writers coming soon, off we go. I’m sure this is will be more than enough to think about for today. If you are just starting out, it may appear overwhelming at first. If so, please take a step back and remember we don’t have to master this all at one time or in one year. If you need to, look at the area that most applies to where you are as a literacy teacher. As long as we are taking steps to move ourselves forward, that’s what counts. To me, interactive read alouds are a vital component to balanced literacy and totally necessary for readers and writers workshop. It’s like the dress rehearsal for reading work and language immersion and play for writing work. It takes the decoding and encoding work away from the learner so they can try and approximate skills that are important to their continued growth as a reader and writer. Because our classroom time is limited and extremely valuable, we need to be on top of our game especially with this work as this is often the time students are trying out new skills for the first time. The following is a progression that I followed as I began this work with interactive read alouds. Use it as is, or tweak it to help set your goal. It’s a tool. Please remember that it is a progression and we work through it one step at a time. I’m going to talk about each section in a bit more depth to give a clearer understanding to help determine whether this is the goal that you are choosing to focus on. Within your work, you may not get to all of these parts in one school year. That’s okay as there are a lot of working parts to practice and fit together. Should you choose this area to be your goal, the hope is to start wherever you are on this continuum and build from there. Choosing Books is essential. Our time is so limited and valuable in our classroom.Yes, we want books that students will enjoy, and we want books with some meat in them, so we can work with and discuss them. We also want to choose books of various genres and lengths to keep a variety in our reading lives. What is the purpose for your read aloud? Perhaps you are working on identifying character traits through character actions. Choose books that do that. By doing this, we are integrating our different components of literacy so with work with each other and not independent of each other. It’s working smarter, not harder. Planning Think Alouds is the first step in opening the door to the invisible process of reading. We show our learners how we think successfully, and how we work through our comprehension struggles. Both are important to model. As I started this work, I’d share my thinking and forget to share my struggles. When working with my students, they were getting frustrated that they couldn’t get it as easily as me and internalized it to think they were a struggling reader. That changed the way I shared my thinking. I mixed it up, so they could see both, and know that they were both natural. Now the first word in this section, planning, is often one thing I didn’t do until I realized I was figuratively throwing spaghetti at the wall and hoping it stuck. I started planning. I would choose the most powerful instances of the strategy I was teaching and preplan what I was going to say on Post-It notes. This allowed me to use my time wisely as I only brought forth what I thought were important moments to share without interrupting the flow of the text. I was able to read more books to my students, and my read aloud time would not go past the time I had planned for it which was usually about 15 minutes. 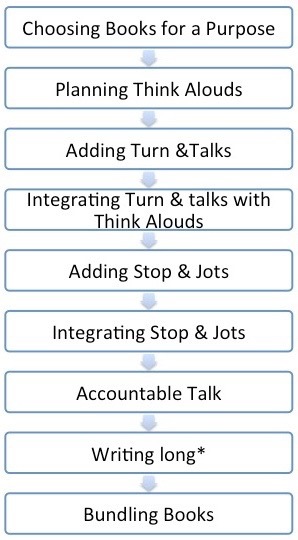 Adding and Integrating Turn & Talks was my next progression. My think alouds were the model, and this was the guided practice. I model a strategy one or two times and then have the learners try it. After all, if I’m doing most of the work, who is really learning? Using the character traits from action example from earlier, I may model noticing a character action and ask myself, “What does this tell me about this character?”, share my thought process, and continue reading. When we read about another character action I may stop and comment, “I just noticed this character’s action. I wonder what this tells me about this character and how I know this. 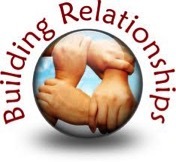 Turn and talk with your partner.” This is, of course, dependent upon already having selected reading partnership for students, which will be a post for another time, as well has having the procedures set up and practiced of how to turn and talk. While students are turning and talking, I stand and walk amongst them listening to their attempts and approximations, coaching in when needed. I follow up with highlighting a few of the comments, so they are validated in know they are doing some good work. Stop & Jots were my next step in expanding my read aloud repertoire. It is very similar to turn and talks, but releases the responsibility even further. I start stop & jots after learners have tried and are successful. Stop & jots are made on Post-It notes. Instead of turning and talking to respond to my prompt, the students write their response on the Post-It and put it in their folder or reading notebook. Sometimes I collect the responses to do a quick formative assessment to see who is really getting it, who is almost there, and who is struggling. This quick data dig allows me to create quick and easy small groups the following day. Of course, I need to add, I always look to see that students I work with have evidence to support their thinking. Stop and jots are important work, but not work that can be easily attempted without developmental appropriateness and having a good foundation in the previous steps. In the younger primary grades, I start this work by having students sketch how the character is feeling at the moment. In my work with read alouds, I have students turn and talk a lot more than stop & jot. We learn to talk before we write. For me, doing a stop & jot is a good way to assess students and have them practice what is going to happen in their independent reading. Accountable Talk Circles are one of my most favorite things to do with students. After finishing a book, or after getting to a really suspenseful part, I have my students join in a circle to have a book discussion. They have to learn to talk about the book in a group without raising hands. A lot of social skills are involved including, adding on to ideas, disagreeing with ideas, asking for evidence etc. Here is an example video of accountable talk circles to help gain a better understanding. This is a student centered activity with strong teacher facilitation. It always surprises me to hear the depth that students go to when having these grand conversations. It is another chance to hear and evaluate where students are as readers and make groups accordingly. I tend to have a less obvious structure in my accountable talk circles. I generally pose a discussion point and let students talk. Some teachers have every student talk. My opinion is that some students are not talkers. They may be more introverted and have difficulty talking in groups. It’s too risky to try at first. With time, all of my students end up talking as I make sure our space is one to explore ideas free of judgment. Writing Long is generally not something done too often in primary grades as students tend not to be there developmentally. I have successfully used it with second grade students, but their work and level of thought will not be the same as those in intermediate grades. Writing long, to me, has it’s beginnings with a similar relationshop to accountable talk circles as stop & jots has to turn & talks. We start with talking and move to writing as learners become more proficient. When starting long writes on books, I have held an accountable talk circle first and then asked students to go write everything they think and have learned about the text. By talking about it first, ideas are brought forth that some students may have forgotten, or some ideas may not have even been thought about. It also helps students focus on the process and not the content. Bundling Books is the process of purposely selecting texts to read in read aloud that connect together within and across genres. It is planned to help students learn to make important, purposeful, and meaningful text-to text connections. Some connections will be obvious and some will be more abstract. What you choose depends on the students that you are currently working with. Some people I know may not agree with putting bundling books at the end of this progression on Interactive read alouds. That’s okay. We will eventually end up at the same place. I am suggesting putting book bundling as one of the last things we attempt with interactive read aloud for a few reasons. Firstly, learning to purposely choose books can be a daunting task in itself. Learning and becoming proficient in the skills needed in interactive read aloud and when to purposely plan and use them with your students is also a great deal of work and practice. To me, bundling books, takes everything else and adds the extra piece to go from good to great. I absolutely think it is a vital component of interactive read aloud as our students are expected to grow ideas across texts, but we need to build to this point. This is a lot of information to process. By all means chunk and chew what is useful to you. Until next time, have a reading and writing -tastic week! When we start planning for reading and writing on my campus, the initial step is to get to the teaching points and plan their order based on student need. It is so very important that those points are clear and precise so students can easily follow along, but is not the be all, end all. We have to make sure that we give the other parts of our mini-lessons almost as much time and consideration as well. They are all needed for the great instruction we want out kids to have. If you are wanting to focus your energy on your mini-lessons, let’s delve in a little deeper. The mini-lesson has four components. They are the connection, the teaching, the active engagement, and the link. They are separate and need to be clearly distinguishable when we are teaching. The mini-lesson is called mini for a reason. They need to be short, preferably between 7 and 10 minutes. To do that, we need to make sure we are teaching one thing and one thing only through the four components. The connection is a time to hook your students into today’s learning. I’m a story teller. I like to tell stories that get students hanging on my every word and make the connection to the learning. My stories are usually from my life. Sometimes I embellish them (I actually do that a lot, but don’t tell! ), and I sometimes completely make them up. They get my students hooked and engaged and ready for learning. I don’t tell random stories though. They do connect, in some way, to what my teaching point is. That’s what works for me. I have colleagues that don’t do that because that isn’t them. Instead, they give purpose to the learning and connect to previous learning without adding all the crazy adventures of their pets or kids. It completely works for them. Whatever your method, it needs to be short, sweet, and neat to hook students and get them primed for learning. The teaching part of my lesson is easily distinguishable. It always starts with, “Today I am going to teach you…” I do that for a specific reason. It’s a cue that the next thing I’m going to say is verbal gold. It is so important that you don’t want to miss it. Then I name my teaching point, remembering to make it short and easy to understand. My teaching points teach what a reader or writer does, how they do it, and why they do it. All three are important. If we don’t know how or why we are doing something, we really aren’t going to use it. About 80% of the time I go on to model the strategy I’m teaching, but that’s not the only way. In addition to demonstration lessons, we can also lead the class on a guided practice, or lead an inquiry lesson. They all work, but they all have different purposes. I usually do demonstration lessons, as it is something completely new that I am showing the students. I use guided practice lessons to add on or touch up a strategy we have previously learned about. Inquiry lessons are used when I want the students to notice, discover and name a strategy that may work for them. They aren’t easy to do, but are so worth it when the lightbulb starts to glow. The active engagement is the “now you try” part of the lesson. I like to have students try the strategy with their partner. I’m not expecting perfection here, as it’s something new. I walk, listen and coach into the many approximations that they are using. This is a great time for me to reflect on my teaching. If they totally aren’t getting, it I’ll have to come back to the lesson in a different way the next day. Maybe I need to add something extra in the next lesson to make it more concrete. Maybe they already know it, and I can move on. Whatever the case may be, it gives me good formative feedback about where the students are as readers or writers and it helps me reflect on my instruction. The link part of my lesson involves me restating the teaching point, naming the what, how, and why. It also includes an invitation to try the strategy when reading or writing and the three famous words, “Off you go!” I chose my words carefully here by saying an invitation. It is exactly that. I may say something like, “When you are reading and your character does something, one thing you may choose to do is stop and ask yourself why the character is acting that way.” The student can choose to use it, if it applies to what they are doing and where they are as a reader or writer. They may choose not to. That’s okay too. I hesitate to make the strategy mandatory work based on past experiences. If I made a strategy mandatory, it took away the independence from my students and became another thing to do because the teacher said so. The whole point of our instruction is for our students to be independent and use strategies when needed. If we make it mandatory, where’s the independence? Yes, students may choose not to use it, and fall flat. That’s a complete learning experience in itself. We can be there to talk through the situation, and coach in to the strategy that may help, yet it is still their choice. I refuse to believe that students, given a choice, will choose to purposefully and repeatedly fail. They may be scared to succeed, but they definitely don’t want to fail. We, as teachers, need to show them the power they have to be successful that each one of them has and how to tap into it even through setbacks. So, think about your mini-lessons. Perhaps you need a planning template to help you. If so, here is one that I am fond of. Are all four parts of your mini-lessons distinguishable? Have you tried different formats aside from the demonstrating? Do your teaching points include a what, how, and why? Is this where you want to really focus your energy this year? Whether this is your first time entering the workshop, or your fifth year, teaching reading and writing using the workshop format is a lofty endeavor. There are so many different working parts that are vital to growing readers and writers. We can’t instantly be perfect in what we do, nor should we be expected to. Teaching literacy is not a skill. It’s an art. That means we will grow and evolve as teachers, readers, and writers as we learn and hone our craft. I have seen teachers try to immerse themselves into the workshop philosophy and be perfect at it, only to become quickly overwhelmed and burnt out. I also lived it. It’s rough and hard, and I felt ineffective. This wasn’t the fault of the workshop and balanced literacy philosophy. Instead it was my overzealousness and aim for perfection. I wanted too much too quickly. This is where goals come in play, taking steps to make us proficient in each workshop and/or balanced literacy component over a period of time. Over the course of this week, I would like to take a look at choosing goals, making goals realistic to help us have the best reading and writing –tastic year we can. To begin, let’s take a look at what building goals entails, so when we are looking at different aspects of workshop, we can keep this in mind. I am a big follower and fan of Jennifer Serravallo as well as the Teachers’ College Reading and Writing Project (TCRWP). I will be using the same terminology they use and borrow this information from them. As I am a firm believer of walking the talk, it is the exact same process I use when working with students on building literacy goals. It is the same process I use for building goals for myself. It forces me to think deeper about the process I will need to take. It makes it more concrete and not some abstract cloud floating out there that I can fluff off. The concreteness helps make me more accountable and more likely to achieve my goal. Each goal is the general area on which you are choosing to focus. It would be something like mini-lessons or conferring. 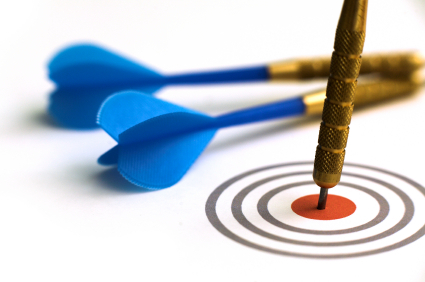 Within each goal are skills that you need to become proficient at. Some have more than others. Maybe you are already proficient in some of the skills, but not others. Maybe you are just starting this work and aren’t proficient in any part of this work. Either way, it’s okay. It is a step on the journey. The important part is that you are taking those steps. Getting back to the topic at hand, each skill has one or more strategies. These strategies are what you are going to do to learn these skills. Maybe it is reading a professional resource, watching YouTube videos on the subject, working with a colleague to get feedback, working with a literacy or instructional leader on your campus, or attending a workshop. The strategies are determined on your learning needs, style, and resources available. Everyone’s path may be different. That’s perfectly fine. Remember, it’s about taking the steps to move yourself forward. So what aspect of workshop do you want to focus the majority of your effort and build a goal on? This is not to say that the other aspects of workshop aren’t important, or that we will coast our way through these areas. We will approximate the best we can on those areas. While doing this, we are picking an area in which we want to focus and improve. I’m suggesting to pick one as I don’t want people to get overwhelmed with trying to be a jack of all trades, but master of none. We all have lives outside the classroom. Trying to do too much does not help anybody and can hurt those around us, so let’s try to keep in manageable. mini-lessons: keeping them mini, the different types (demonstration, guided practice, inquiry), connecting them to other learning and read alouds. conferring with readers and writers: keeping them efficient, specifically choosing a strategy to teach instead of just picking something random, knowing your students, etc. a form of small group instruction: guided reading, strategy groups, etc. It’s a lot to think about, isn’t it? This is why some people can get frustrated with workshop. There isn’t an easy go-to manual for everything. Remember that we work on one while approximating the rest. Over the next few days we will look more in depth into a couple of these areas to help explore which one would be the best goal for you. Until then, have a reading and writing -tastic week!